Slip into a comfy pair of shoes and hit the Millennium Trail in Thompson. The 15-kilometre hiking and biking trail loops around the city, passing through boreal forest as well as urban areas. Be sure to drop by the Heritage North Museum to peruse exhibits and pick up visitor information. Thompson’s 2.5 kilometre Spirit Way overlaps with the Millennium Trail. Explore points of interest along the way, including a reproduction of a Norseman float plane at Lions Club Park. Thompson’s newest park was opened and dedicated in 2008, during the 100th anniversary year of Canadian aviation. Along with the float plane, the park overlooking the Burntwood River contains a new Children’s Adventure Playground. Be sure to watch out for the Spirit Way wolves. There’s a series of painted wolf statues along the path — as well as a scene of wolves howling at the moon carved out of limestone — and a 10-storey-tall wolf photo-real mural produced by Charlie Johnston from a sketch by famous wildlife artist Robert Bateman. In The Pas, head to Devon Park to access a 10-kilometre path that skirts around the town. Or join Sam Waller Museum staff for a historical walking tour of the downtown area, where you’ll discover fascinating facts about “Millionaire’s Row” and an 1896 church with a connection to a Franklin expedition search party. You can also book a walking tour of Flin Flon and learn about its unique history, or just stroll on Flinty’s Boardwalk and Flinty’s Trail, a 4.2-kilometre jaunt around Ross Lake and on to the uptown area. Leaf Rapids has several paths and bush trails that wind through the forest and across ancient eskers and sinkholes, and Snow Lake is another great spot for happy feet. Meander along three groomed trails outfitted with interpretive signs that introduce you to some of the birds you might encounter, including the common raven, downy woodpecker and pine grosbeak. 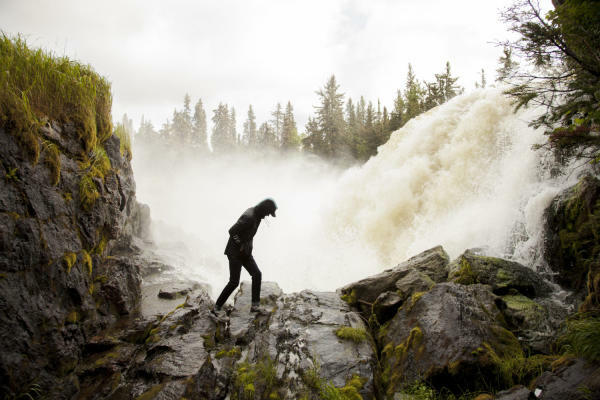 You’ll find more challenging trails at Wekusko Falls Provincial Park, just 10 minutes south of town. Venture across two suspension bridges and view the falls from walking trails along the shore. From there, you can carry on another 27 kilometres to Grass River Provincial Park and take a self-guided 3.2-kilometre round-trip hike to Karst Spring — a stream of water that surges out of solid rock. Near The Pas, take a self-guided tour of Clearwater Lake Provincial Park’s caves, and don’t miss Pisew Falls, about 75 kilometres south of Thompson. View the falls from an observation platform and cross a suspension bridge to reach the trail to Manitoba’s highest waterfall, Kwasitchewan Falls. See www.manitobaparks.com for more provincial park hiking information.